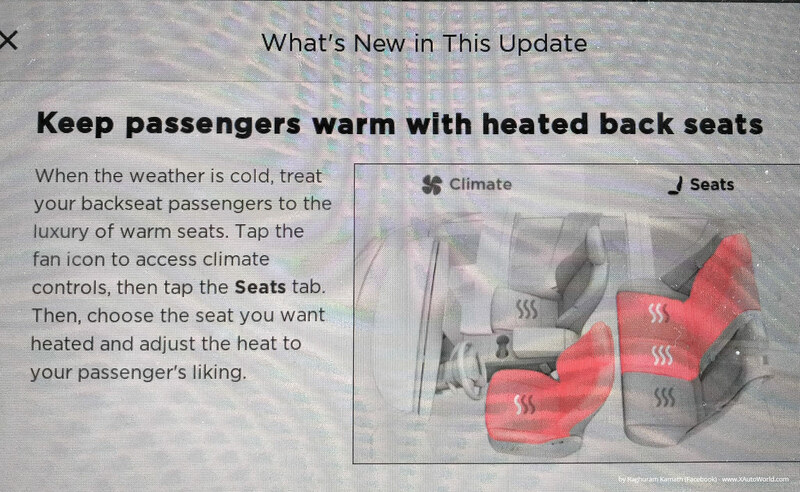 Tesla Model 3 heated back seats feature has been demanded by the owners and reservation holders for some time and Tesla Inc. has granted the wish to it’s loyal customers this week in their latest software update (2018.10.1 5e8433d). The Tesla vehicle fleet gets regular over-the-air (OTA) updates for feature enhancements, bug fixes, roll-out of new features and easter-eggs. First report of the current software update was posted by Raghuram Kamath in the Facebook group Model 3 Owners Club. The latest Model 3 updates include Heated Back Seats, Increased limit of Automatic Emergency Braking, Unlocking Tesla Model 3 with Phone Key and Touchscreen icons rearrangement (Release notes and screen-shots below). Just found a nice video on YouTube by Marc Benton with a clear demonstration on how to turn ON and OFF the rear heated seats, watch below. Automatic Emergency Braking is a vital part of the Tesla Autopilot software assisting the human driver for enhanced safety of the occupants, pedestrians and other vehicles on the road. Previously the max speed at which AEB could be used was 50 mph (80.4 km/h) and now it’s increased to 90 mph (144 km/h) which is a huge progress in one of the safest sedans in the world. You can disable the feature temporarily, check out Tesla release notes below for instructions. 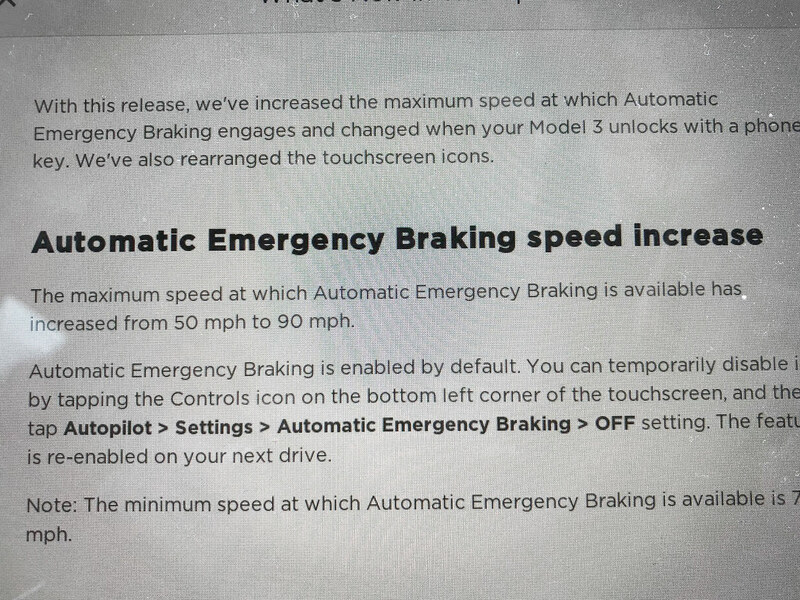 Tesla Model 3 - Automatic Emergency Braking Increased to 90 mph. Click image to zoom-in. Credits: Raghuram Kamath. Tesla enhanced another Model 3 security feature enabling the car owners to unlock the vehicle just by pulling the door handle — in order for the feature to work the owner needs to keep their phone with a paired Tesla App in their possession. Taking customer feedback seriously and taking care of complaints has been a great tradition at Tesla — the current software update rearranging the icons reflects just that culture. Screenshot above explanation of the feature in text below.